The intent of this article is to describe in detail the setup and configuration of N1MM for voice keying with PowerSDR. The configuration of VAC’s parameters other than the audio and PTT are outside the scope of this article. In this procedure we are assuming that you have your software defined radio and PowerSDR properly communicating and are using the most current versions of PowerSDR. It is also assumed that you have VAC and your virtual COM port program properly configured. This procedure was developed using the FLEX-5000, so it is important that you have the latest Firewire driver and firmware loaded for your radio as well. It should work equally well on any Flex radio. You can download N1MM software from the N1MM Home Page . For this procedure, N1MM 11.7.0 was used. 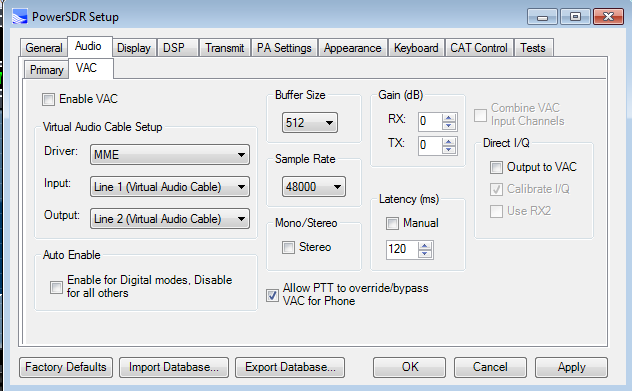 VAC is a program that transfers the RX/TX audio from PowerSDR to N1MM and subsequently transfers the TX audio from N1MM to PowerSDR without using a physical interface between the radio and a computer sound card. VAC makes PowerSDR "look" like a sound card or Windows audio device to N1MM. The benefit of VAC is that the audio exchanged between PowerSDR and N1MM stays entirely in the digital domain resulting in high dynamic range signals and there are no wires to introduce RF into the software defined radio system. VAC is not free open source software. It must be purchased from the authors web site. There is a demo version of VAC but it cannot be used because the demo version corrupts the audio I/O with a pre-recorded voice telling you it is demo software, essentially making it crippleware. For this procedure, VAC 4.09 (4.90) was used. Version 4.10 is NOT recommended as it has caused issues on some systems. 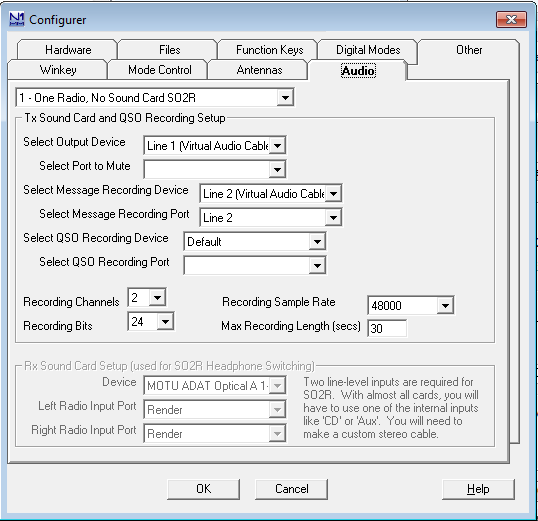 Once the required software is downloaded and installed on your computer, the next step is to configure PowerSDR to use the VAC virtual audio cable for audio. 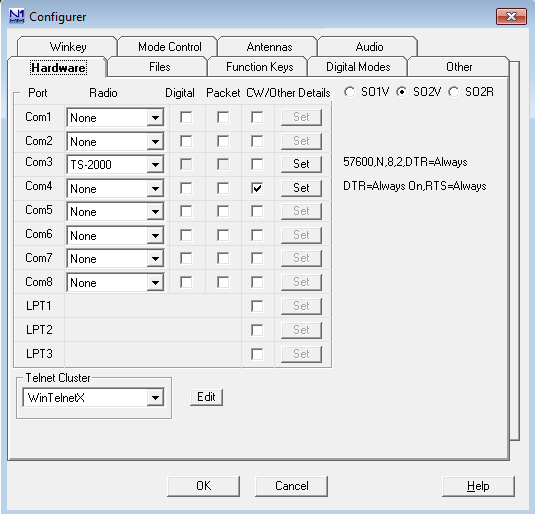 For this procedure PowerSDR 2.1.3 was used. The final step is to configure the audio input and output connections for N1MM. This is probably the most confusing part of the N1MM configuration. N1MM has recently been improved to allow separate sound devices (cards) for input and output. This allows PowerSDR to seamlessly interface with N1MM. Using the URL listed above in Step 1 of the Configuration Overview and Required Software section for the N1MM home page download and install N1MM. If you are unfamiliar with the concept of virtual com port pairs that are sometimes called virtual null modem cables, you can refer to the Knowledge Center article, What is a virtual com port or null modem emulator? 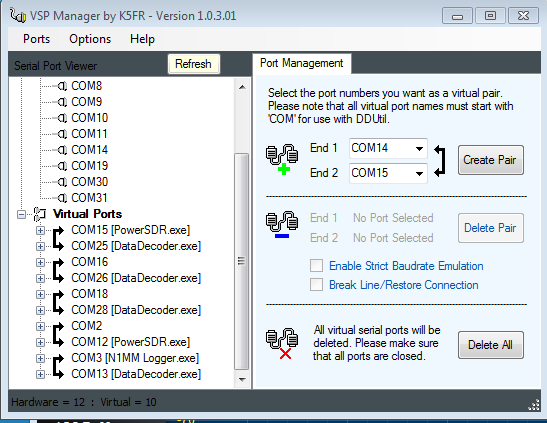 , for a detailed description of how virtual com port software works. This is a screen shot of VSP Manager Settings. Note this screenshot shows a set up for using DDUtil but for the purpose of this example we’ll use port 3/13 and assume DDUtil is not in use..
As noted above, you must purchase VAC as it is a commercial product. Using the URL listed above in Step 3 of the Configuration Overview and Required Software section for the VAC home page you can purchase your copy of VAC if you have not already done so. If you have VAC 4.x, but it is not version 4.09, you are entitled to get minor version upgrades. To get them, you must contact the company or software distributor from whom you purchased VAC from initially as the upgrades are not directly available from the VAC home page. This procedure has not been tested with the 3.x version of VAC and some older versions of VAC 4.x have been reported not to work for whatever reason. The VAC package is distributed as a ZIP archive. Simply unpack it into an empty folder, run setup.exe application and follow the instructions displayed. If you are installing VAC for the first time, please review the readme.txt and vac.chm (Windows Help) files before installation. If you have already installed previous version of VAC 4.x, don't forget to uninstall it before installation. Using the Knowledge Center article, How to Setup Virtual Audio Cable (VAC) 4.0x with PowerSDR 1.x , execute steps 1 through 3 for the instructions to configure the two (2) VAC audio cables. The instructions in the KC article represent a very "conservative" configuration. For the N1MM configuration, we will use a more optimized configuration but it will work with the conservative configuration. Using the same Knowledge Center article referenced in Step 3, How to Setup Virtual Audio Cable (VAC) 4.0x with PowerSDR 1.x , execute steps 4 through 6 of the instructions to configure the PowerSDR VAC Audio parameters. NOTE: Do not worry about the TX and RX Gain (dB) values, those will be set later. 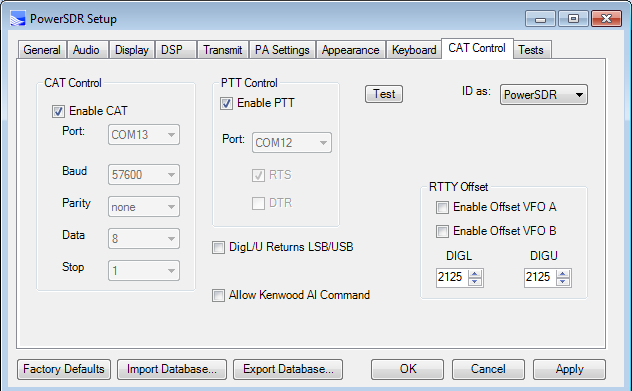 Configure PowerSDR to use a com port for CAT control by configuring. PowerSDR will use the virtual com port 13 of the virtual comport pair 3/13. Select the CAT Control tab. In the CAT Control section, click on the drop down box and select the virtual com port of the virtual com port pair defied previously in a step above. In this example I used COM13. Check the Enable CAT check box. First, we will set up the CAT port for N1MM. Using the drop down box select TS-2000 in the other half of the virtual serial cable port pair you previously set. In this example check Com3 of the 3/13 VSP pair. Within N1MM left click on Config, and choose Configure Ports, Telnet Address, Other. Left click the Audio tab. Configure as shown in the following screenshot. You can leave the remainder of the settings in their default values. Switch to LSB or USB mode and make sure VAC is enabled. Output to VAC should not be checked. To record a sound clip, with N1MM in focus, press CTRL-Shift-F2. To stop recording press CTRL-Shift-F2 again. Press PTT or MOX within PowerSDR. You can set your power level to 0 if you don’t want to produce RF. Press your F2 Key that you previously recorded and test hat PowerSDR transmits the audio properly. You may enable MON within PowerSDR to monitor the audio on your signal. Adjust the gain within PowerSDR VAC to the properly level using the ALC meter. Article has been viewed 22,078 times. Execution: 0.781. 9 queries. Compression Disabled.